Mom pulls out EMLA cream and Press n Seal (which for those of you confused by that, instead of using tape to apply the numbing cream which is hard on her skin, we use a big patch of Press n Seal and it adheres to the skin almost like tape, but comes off easily). She knows immediately that we’re heading to the clinic. Mom applies EMLA cream to port while Peyton puts up very vocal complaints about how cold it is. Mom tells Peyton to turn around so cream can be put on her back in preparation for her spinal tap. “Is it going to squish me?” This is referring to the procedure where the nurse has to curl her into a ball and basically sit on her to hold her still because she fights like a rabid gopher. After adjusting all the Press n Seal, putting the clothes back to normal and squirming around to get used to all the paper on her, she’s disgruntled to say the least. I have to tell you, if I knew I was going to get a pokey in my adult back, having cream all over me wouldn’t be the loudest of my complaints, but she’s a resilient little girl and puts up with it all. She did get her back pokey, but not quick enough because she was starving by the time it was done. She doesn’t get to eat before the spinal procedure and by the time they got it all ready to go I think she was irate and hungry enough to give herself a spinal if we’d just give her pepperoni afterwards. After the spinal tap and methotrexate is administered, she has to lay on her back for half an hour so it can travel to where it needs to go. She laid there with a peanut butter and jelly sandwich in her mouth, dripping jelly all over her cheeks and neck. It’s pretty amusing to watch. In the span of an hour, she ate a pb&j, half a banana, a bowl of pepperoni, a can of chicken and stars soup, and four containers of apple juice. She got more medicine administered through her port without a hitch, then sat on her behind until 4:30. We watched movies, she finally fell asleep during “The Sound of Music”, which means she missed all the nurses and staff singing along….she definitely regrets that one. Peyton’s hair is falling out again, her peach fuzz is slowly melting away, leaving the softest shiny patches all over her head. She’s feeling good as she comes off the steroids, her appetite is still good and her sleep patterns are still crazy, but she’s got great color and she’s happy. Her blood counts were decent today, all in good ranges, but in the next couple of weeks they’ll drop drastically with the amount of chemo she’ll receive. We have to be up there four days this week for chemo each day, plus chemo that she’ll get each night at home. 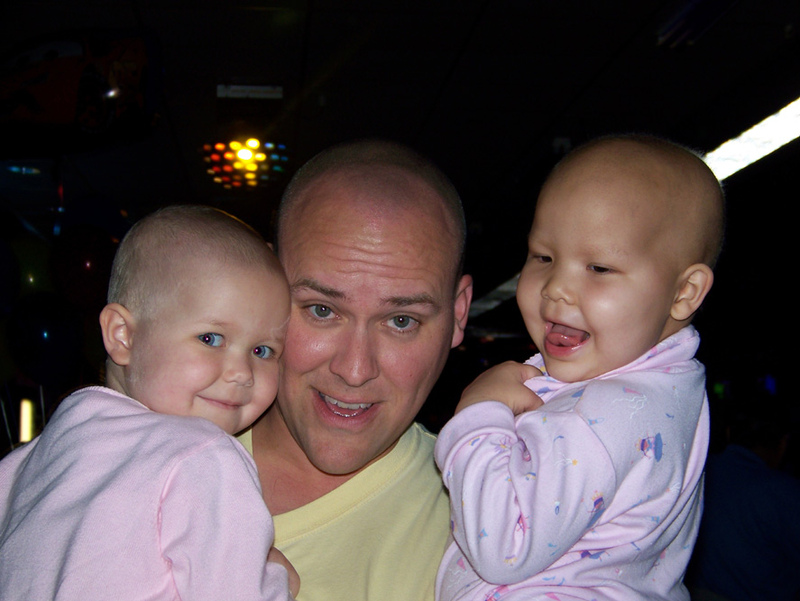 Peyton with Adelaine and Doug Powell, proving that Baldies have more fun! This weekend was busy. 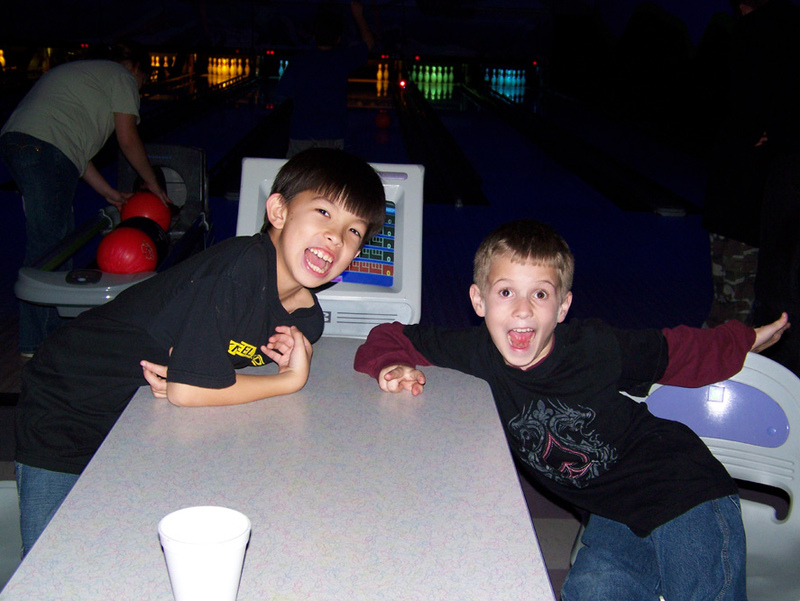 Saturday we had Nathaniel’s birthday party at the bowling alley. 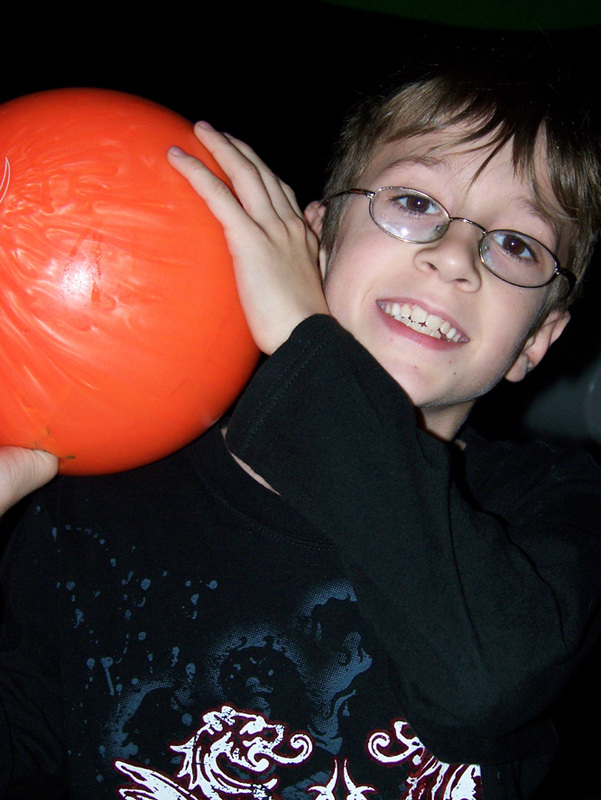 It was so much fun, the kids loved the cosmic bowling, where they turn off the lights and let the kids bowl with glow in the dark balls and pins. We had a good turnout of kids, Nathaniel was so happy and it was organized and simple for me. We had pizza, Darth Vader cake and ice cream, Peter and I cheated on our diet unashamedly. 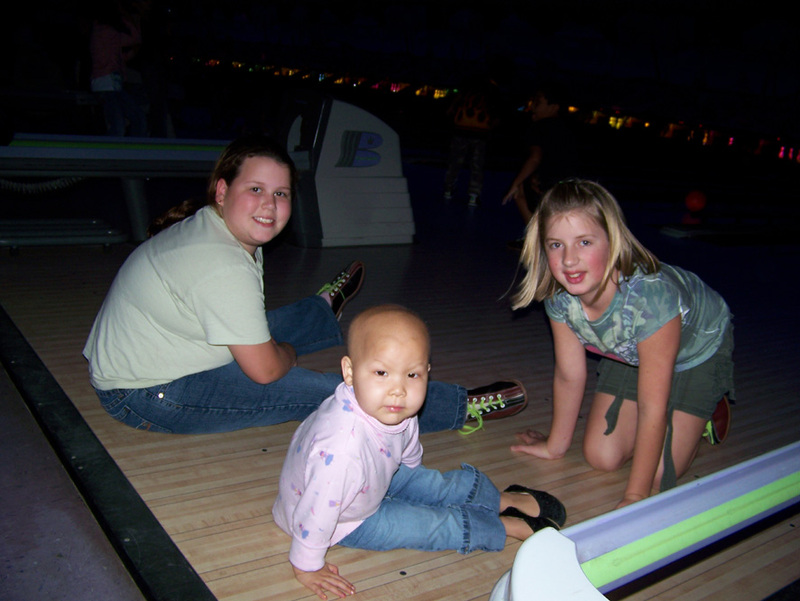 Peyton loved bowling, she’ll tell you “I rolled the ball fourteen times!”, and Rachael managed to bowl in the dark with sunglasses on. That kid is just too cool. Rachael got a gift of makeup at the party and in it was a big pot of glitter. For anyone who remembers the post about Rachael and glitter, this may be redundant, but she did it again. 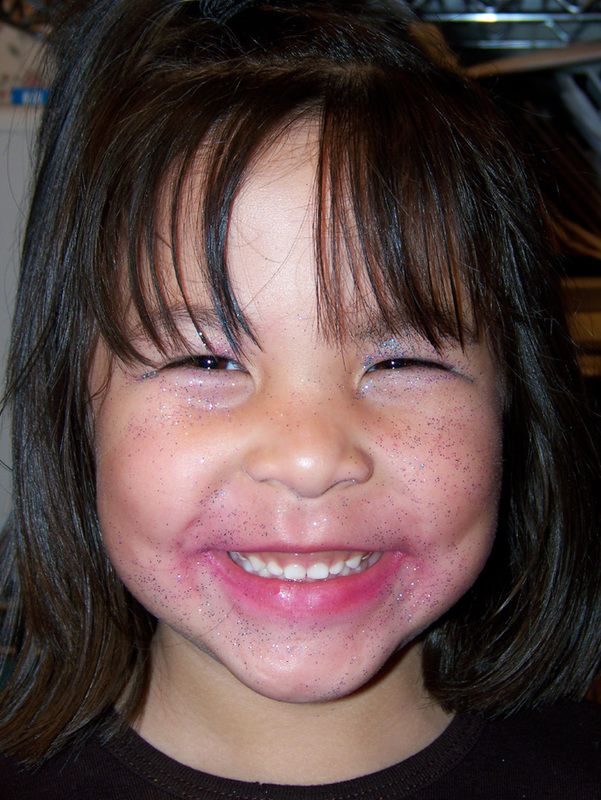 She had so much glitter on her face and body that she looked like she’d developed some sparkly form of leprosy! That girl and her makeup are just too much. This morning, Peyton and I had to be at the clinic by 8:30 and that left Dad home to get the kids to school. When you’re a mom leaving dad home to get the kids off to something when he’s not normally the one to get them dressed and ready, it can be an experience to come home and find out what they wore for the day. Today was exceptionally fun because it’s spirit week at the school and today was clash week. Basically, anything they wanted to wear was fair game. I did end up helping them pick out clothes because it was too much fun not to. Picture it (because as snap happy as I am, I didn’t have time to photograph the kids this morning, of all mornings!) Rachael left with bright polka dot socks, two different shoes, purple floral pants, a white turtleneck with red hearts, a tshirt with red and orange stripes, half her hair braided, half her hair in a ponytail and a grin big enough to eat her whole face. She looked at herself and announced “I look horrible!” Nathaniel wore camo pants, a bright green shirt topped by a brown Hawaiian print shirt and a tennis shoe and a sandal. He was thrilled and I don’t know that he felt there was a whole lot wrong with the outfit…scary. I left my house with my kids heading to school looking like color-blind rejects from Project Runway. Our American Cancer Society Relay for Life team is starting to pick up slowly, our neighbor Greg joined and we’ve gotten some donation support. We still have a ways to go to meet both our team and donation goals, but I have no doubt that we’ll get there. If anyone wants info on joining or donating, go to Team Peyton. Our dear friend Harry Greenaker heads in for his spinal surgery tomorrow morning. He needs all our prayers of support and encouragement. If you have a church that you can add his name to a prayer list, it would be such a blessing to the family.